Take note that this code is not important at all. It simply creates random data points and does a simple best-fit line to best approximate the underlying function if one even exists. If you don't this you will get an error stating you need 2D. Simply just reshape accordingly if you ever face such errors down the road. We want y values for every x value we have above. If you're weak in list iterators, this might be an easier alternative. 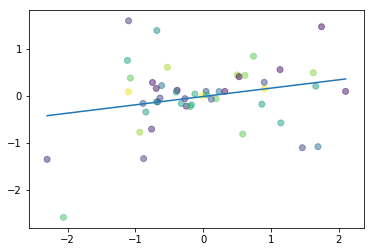 You will slowly get a hang on how when you deal with PyTorch tensors, you just keep on making sure your raw data is in numpy form to make sure everything's good. Output \hat y = ? 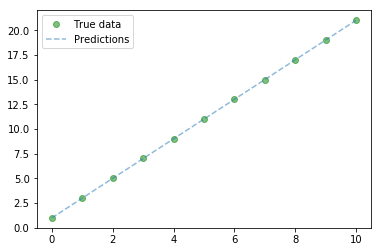 These are the true values, you can see how it's able to predict similar values. How to bring to GPU?